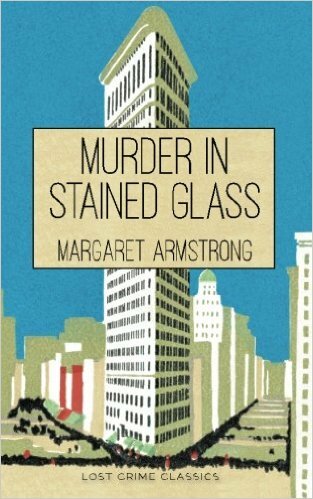 Murder in Stained Glass is the opener of a new series called "American Queens of Crime", issued by Pepik Books. Claire Theyers, the owner and director of this small press, has stated that "only quality fiction" that she's read and "truly enjoyed makes it into the series." Bravo for her -- and good for me, since like Ms. Theyers, I am constantly on the lookout for books from authors whom, as she notes, are "long forgotten about and their stories gathering dust in bookshops and charity stores." "It's like the nursery rhyme about the old woman who milked the cow with the crumbled horn. If the weather hadn't cleared I wouldn't have gone to stay with Charlotte Blair; I shouldn't have been on hand with my eyes wide open when things began to happen; I shouldn't have been forced to play the part of innocent bystander -- a dangerous part when bullets are flying about; and as I should have known nothing about the case, except what I read in the newspapers, I couldn't have been of the smallest use to anybody concerned." But the weather indeed cleared, and Miss Trumbull went off to Bassett's Bridge, Connecticut, to visit her rather moody old school friend Charlotte Blair. Truth be told, she isn't that fond of Charlotte, but the lovely young girl living with "Cousin Charlotte," Phyllis Blair, is another story. The three of them make their way to the workshop of artist Frederick Ullathorne, who has just finished a lovely (albeit somewhat flawed) stained-glass window destined for a New York cathedral. Phyllis and Ullathorne's son Leo are an item, and provide delightful company for our heroine. A week goes by, and although she's having a lovely time with these two young people, Miss Trumbull starts thinking that she'd "had about enough of a peaceful country life," and is ready to return to the city. But her plans are delayed when "our peace broke with a vengeance" -- to everyone's horror, news arrives that bones have been discovered in the kiln at the glass shop. Unseen by the others, Miss Trumbull watches young Leo pick up something out of the ashes; later it is revealed that it is a dental "appliance" belonging to his father. At the inquest, the coroner offers his opinion that "for some sordid reason" "a great genius was taken away at the height of his fame." As the rumors fly as to who may have done away with Mr. Ullathorne, Miss Trumbull decides that she has to do something because suspicion is quickly mounting against young Leo. She knows that something is not right and has some leads of her own to follow even after returning to New York, but she is warned more than once that her role as "Meddlesome Matty" might land her in jail or even worse. The blurb on the back cover of this book notes that "If you like Agatha Christie then you'll love Miss Trumbull," and while this book may definitely appeal to Miss Marple fans, Miss Trumbull is a delight on her own. She is quite independent, both in terms of money and personality, and doesn't let little things like an attempt on her life or potentially dangerous situations get in her way. In contrast to her friend Charlotte, whom Phyllis describes as a "gloomy old lady in black and rather severe," Miss Trumbull is full of life and energy, well respected and a hit with the youngsters. The novel also has one of the best twists that I must say I never saw coming -- and in this book, there are a number of potential suspects as well as a few well-placed red herrings that will keep any reader guessing. Yes, it's a bit dated but once in the mindset of the period, it became a fun, interesting and delightful read. A wonderful review, and I love an unexpected twist at the end; it makes the read exciting and worthwhile. In addition, I have a wild penchant for stained glass. My only regret is that I have not read any of these wonderful and unique books you have chosen to journal about; in a sense, I feel somewhat at a loss. I have been amassing old books -- both old and new editions, and most of them are by authors I've never heard of. So when I get tot them, they're all new to me.